For Rhonda S. Ferguson, her position as executive vice president and chief legal officer at Union Pacific Railroad provides a rare opportunity to serve in a historic company that remains an integral part of the American economy today. Ferguson joined the $20 billion enterprise in 2016 after an executive recruiter approached her about a position at the company’s Omaha, Nebraska, headquarters. She initially dismissed the idea of leaving her hometown of Cleveland, where she had built a 20-year career in litigation and corporate law. Nonetheless, she discussed it with her husband, and they decided it couldn’t hurt to hear more about the company. 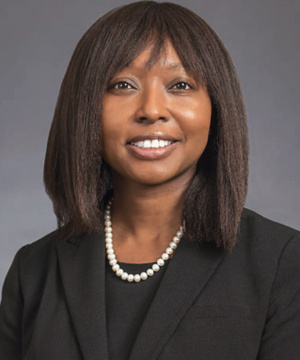 Earlier in her career, she served as assistant general counsel and assistant corporate secretary at Ferro Corporation, and before entering corporate law, she was a partner at BakerHostetler LLP and a litigation associate at Thompson Hine LLP. She earned her juris doctor degree from Case Western Reserve University. She remembers her time at Northwestern fondly and stays in touch. In 2016, she participated in a panel discussion hosted on campus by the National Society of Black Engineers, an organization that has served as a vital support network for her. The first in her family to graduate from college, Ferguson’s experience and success helped persuade her sister Rita Beckford (’94) and daughter Kristen Ferguson (’20) to pursue Northwestern Engineering degrees.